Have you ever wondered the role of appetizer in a course of meal? a small dish of food or a drink taken before a meal or the main course of a meal to stimulate one's appetite. Do we actually stick to this definition? Definitely not. If you ask me, the heaviest part of the meal calorie wise are desserts and appetizers. Not even the main course. I am talking about a regular Indian party food. I haven't been to other cuisines' elaborate meals, so can't talk about that. The moment people talk about food in an Indian's party, discussion goes to different courses of the meal. What was for dessert? How many starters did they have? Roti or Naan? North Indian or South Indian? it goes on and on. Also, most of the people think a party isn't complete without having samosas or pakodas. Being a foody, I hate to see those two items in any party. And having cooked for big crowds so many times, I tell you the hardest course of the meal to prepare for a crowd is appetizer. If you stick to these deep fried staples that is. So, how would you tackle the appetizer issue when cooking for a crowd? 1. Choose something very simple. It need not be an elaborate, deep fried food. Think of what you can make a day in advance and serve without losing the taste, flavor. 3. Pick a chaat as appetizer. Buy most of the things made and mix with fresh cut veggies or make it yourself a week before. Bhel puri, Pani puri, Sev puri are all doable this way. 4. Try serving a light salad. 5. Make two or three kinds of dip, salsa with corn chips or pita chips. 6. Make a light soup. Serve with bread croutons. 7. Make the samosa filling and use phyllo sheets to cover them. Freeze and the day of the party, bake. 8. Buy already made frozen appetizers and heat in the oven. 9. Even though sandwiches are kind of main course, make a nice chutney as the base, top the bread with the chutney, then with thinly sliced cucumbers, tomatoes and top it with either cheese and bread or just plain bread. Cut these into tiny triangles and add a toothpick to hold them together. These make great appetizers too. 10. Make steamed appetizers like dhokla or idlis. If making idlis, make them in a big pan and cut them into tiny pieces. Sprinkle some kind of spice powder like chutney powder or idli molagai powder mixed with some oil. Serve. Tips like these can go on and on. If any of you have any tips or ideas, please chime in. If you google microwave doodh peda, you will get many hits. Most of them use milk powder, butter, condensed milk. When I made it for the first time some time back, I had added shredded coconut to it for a change and I liked it very much. Recently, I ate a burfi in someone's place. People ask me to guess what it is and when I said milk peda, the host said I am wrong and it is badam burfi. I couldn't believe it so asked her the recipe. What she told was the recipe of microwave doodh peda but with almonds added. I added cashews for a change. My whole family loved it. This is an easy recipe, so you can make it in a jiffy. But beware, this is addictive. Since it is one of those sweets which is not sickeningly sweet, it is hard to stop eating it. Take a deep microwavable bowl. Melt butter in it. Take the toasted, cooled nuts in a blender jar. Add dry milk powder to it and pulse. It need not be a fine powder. Coarse powder adds a texture to the end product. Go ahead and powder it fine if that is how you like it. Add the condensed milk to the melted butter and dump all the dry mix to it. Mix well and microwave for 5 minutes at 1 minute intervals. (My microwave is not a very powerful one, stop microwaving when you see color change in the mixture. It took 5 minutes in mine, but might be more or less in yours.) Stir between each interval. Add powdered cardamom, saffron if using and mix well. Let it cool for 10 minutes. Either you can grease your hands with some ghee and shape into pedas. I used the easier method of pouring into a 8" square pan lined with wax paper. Smooth and let it set for about 30 minutes before cutting. It actually becomes easier to cut if you put it in the refrigerator for some time. Either make them into squares or use cookie cutters to get pretty shapes. Keep it refrigerated. I have been living in U.S for 16 years now. Used to throw a lot of parties. I have never catered food from anyone till today. Some people might think it is because of the number of people. I have a record of cooking an elaborate meal for 80 people all by myself. So, number is not the issue, just my preference. When I say this, I have nothing against getting food from outside. But, having eaten catered food at lot of places has taught me few things about catered food. I am sharing those tips in case it helps anyone in planning their parties. 1. Know what to expect. If you are getting food from a restaurant, make sure you have tasted your dishes. It might not be possible to taste all the dishes if you are getting from someone working from home. Rely on word of mouth. 2. Order as per the season. Avoid ordering food that goes bad very easily. It is best to avoid things that have coconut, mashed vegetables in hot weather. 3. Calculate the distance from where the food is coming. Food goes bad as early as 4 hours from the time it was made. If you plan to pick up the food a bit early, plan on refrigerating. Caterer starts cooking food at a certain time based on your time of pick up. Don't try to rush him/her and end up having to deal with the worry of food going bad. 4. Unless it is for a traditional, religious event, try mixing and matching types of food. Be creative. 5. Even though you are getting food catered, make something yourself. Something that is your signature dish and liked by all. There should always be a personal touch. 6. Don't order from a person just because they are cheaper. It definitely doesn't mean that more the price, better the quality. You need to know what is good and be willing to pay the price if it is good. 7. Set aside a budget. Stick to it. No need to get extravagant food and not enough of it. It is better to serve simple, well made food rather than serve exotic food that nobody wants to eat. 8. Make sure you as a host taste everything before you put it on the table for others. I have seen food having gone bad too many times and it is not nice to your guest to eat that and realize it has gone bad. 9. People enjoy food more when there aren't too many varieties. I lose all my appetite if I see arrays of trays. See if that makes sense to you. 10. When you get food delivered, if it comes in a warm box, make sure you remove the food trays and keep it in an airy room. Basement is actually the best place to keep the food in case there is time before serving. If the weather is warm, run your air conditioner or at least a fan. 11. It is always best to label your food. Lot of times, people won't know what it is and it helps if there is a label. 12. If possible, introduce a food that you have liked but is not known to most of your guests. It makes a nice topic of conversation while filling the plates. If the party is at home, trash pickup needs to be paid attention to also. With disposable plates and people not reusing the cups, plates, it gets full in no time. It helps to bring in the huge trash container inside if you can find bags to fit them with. What I do is line a collapsible laundry basket with multiple huge trash bags. Once it is full, just take out the top bag and tie it. It makes it very easy instead of looking for a bag and lining when the bag is full and there are people waiting to throw their plates. If anyone benefits from this article, it was well worth of the time taken to write. "An apple a day keeps doctor away, A hobby a life keeps Psychiatrist away"
First part is a known saying, second part is added by me. It has been a long time since I wrote a blog post. You see, if there are people who lack any hobby (example my husband), I am one of those who have too many hobbies. Juggling life with hobbies becomes challenging and it is more difficult if one hops from one hobby to another like I do. 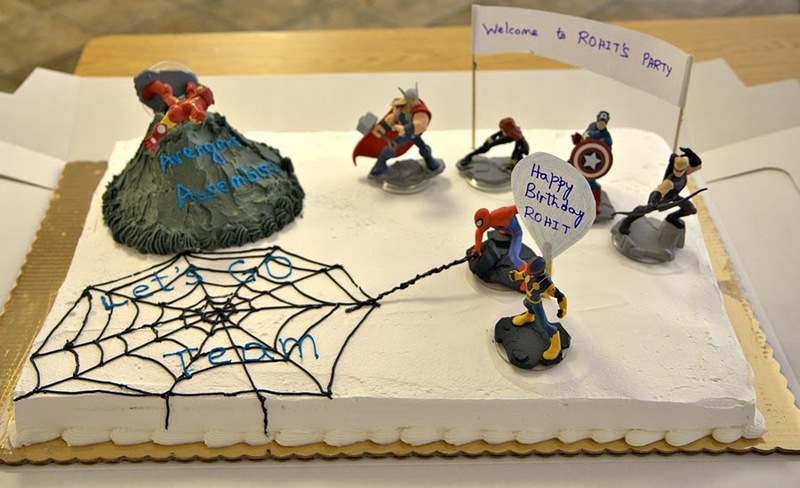 Coming to the point of this post, even though I have been super busy with life, hobbies, I did find some time to decorate this cake for my friend's son's birthday. Nowadays, I tell people to get the plain cake from the bakery and I just do the decorating since it is not as time consuming. 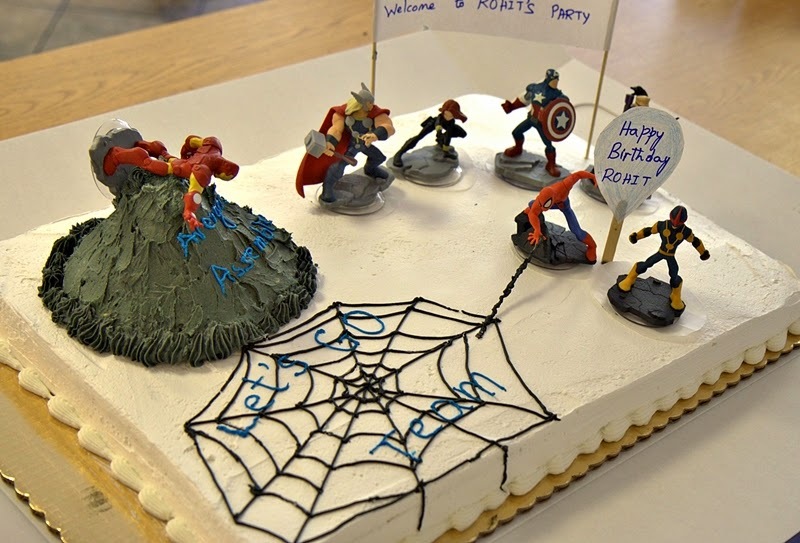 Birthday boy has a collection of super hero figurines and he wanted them on his cake. Since I have two girls, I know nothing about these super heroes but put together something that the kid suggested and my kids told some stories about. Birthday boy wanted iron man to fly and I faked it by building a rice crispy mountain and leaning iron man on top of a Popsicle stick. Spider man looks like he is shooting the web. The stick is a spaghetti on which I piped some black icing. This was done when I was surrounded by 15 kids talking simultaneously at the party hall. It is one of the simplest cakes I have ever decorated but the birthday boy was happy. That's all it matters, right?